“Any fifth-grader can tell you that our addiction to single-use plastics is killing our ecosystems,” said Assembly member Lorena Gonzalez of San Diego, California. This past year, Grades of Green Eco-Leaders have worked to reduce hundreds of pounds of waste, presenting their sustainability solutions to their school, their local government, and their community. Through the Water Campaign and Waste Campaign, students from 16 countries, representing 77 cities, contributed to a global effort to reduce waste, conserve water, and educate their community. 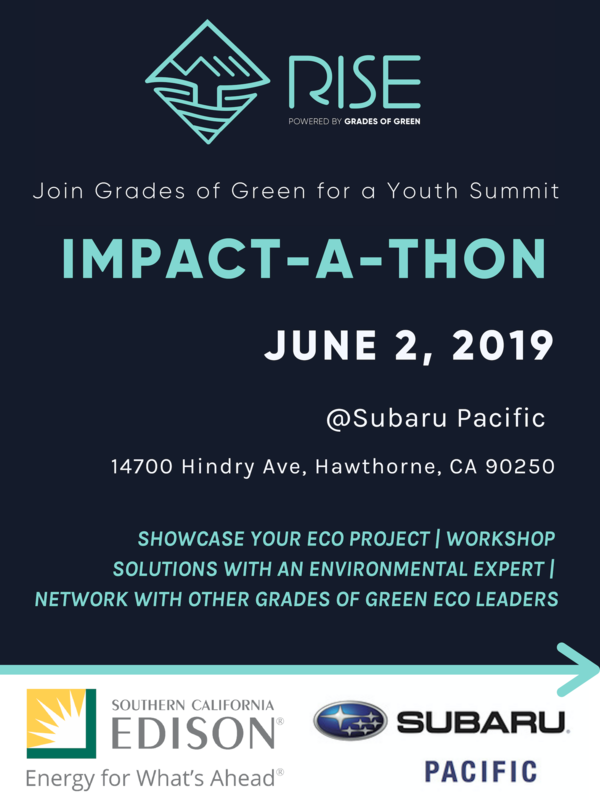 On Sunday June 2nd 2019, our students will present their innovative solutions at at Subaru Pacific in Hawthorne, and you are invited to celebrate these bold innovators, as Grades of Green holds its first ever Youth Summit: Impact-a-thon! In an event that is open to the public, we will be taking a day to reflect on the success of our Eco-Leaders, sharing their projects and their triumphs. We will recognize the collective impact, as well as the individual impact, Campaign Teams have had on their community and the world. Get inspired by student leaders presenting their innovative eco-solutions, build advocacy skills during an expert workshop, network with the Los Angeles green community, and learn about upcoming sustainability opportunities. Lunch and eco-goodies will be provided. This event is open to the community, so we invite you to bring friends and family to Subaru Pacific on June 2nd! Check out this Impact-a-thon Facebook Event to RSVP and learn more. The Impact-a-thon is free and open to visitors of all ages. The Impact-a-thon is open to our global Grades of Green community as well! If you can’t make it to California and would like to participate virtually, the Impact-a-thon student presentations and interactive workshop will be streamed via Facebook Live. REGISTER TO PRESENT YOUR PROJECT HERE BY MAY 10th if you are a student leader who has completed a green activity that you are proud of this past school year. Presentations will be science-fair style, and prizes will be awarded to the most innovative and creative project displays.